It is common these days to get promotional messages and phone calls from banks offering personal loans and credit cards. Banks have been doing this more aggressively since demonetization of high-value currency notes in November 2016. Apart from other things, this move led to the banks ending up with excess liquidity. And since then, the banks have been trying to capitalize on this liquidity by giving out more loans, even if it at marginally lower interest rates. But why are they pushing credit cards? A credit card too is a kind of unsecured personal loan. However, credit cards have not found acceptance among the bulk of banks’ customers. According to latest data from the Reserve Bank of India, for November 2017, there were just 3.47 million credit cards in the country. This is only 4.17% of the total number of debit cards. But this is not the full picture. The penetration of credit cards is likely to be even less when we consider that while most bank account holders have only one debit card per account, many bank customers hold more than one credit card. In fact, according to Credit Sudhaar—a credit advisory—on average, a credit card user in India has 2.2 credit cards. Banks determine your credit limit based on your credit worthiness, which could include not just how you treat your liabilities from the past but also the cash flow in your bank account. So, if you have a healthy cash flow or a good amount of disposable surplus in your account, the bank is willing to offer you a credit card. For a consumer, the biggest benefit of a credit card is that it offers interest-free credit for up to 45 days. Moreover, it is not mandatory to pay the entire amount due. Customers can pay only the minimum due amount, and pay the rest later. If you pay only the minimum amount due, you will not be charged a late payment fee. However, you will still have to pay interest on the balance amount. There are many different varieties of credit cards. Some of these cards are designed to cater to users who prefer to use their credit cards for spends in specific categories. For example, there are co-branded credit cards that give brand-specific deals to the card users. Such credit cards include travel or airline cards, which give rewards points for travel or airline bookings. Co-branded fuel cards are in the same category, giving reward points for purchasing fuel through these cards. This is where you need to strategize if you are using multiple credit cards. First, look for cards that have low fees, or no fee at all. “Majority of the cards that provide good reward points come with an annual fee. It is for the users to quantify the benefits they would get versus the annual fees they would pay," said Rajiv Raj, co-founder and director, CreditVidya, which offers alternative data based credit scores. Based on your history, the card issuing banks may waive the fees on credit cards. Choice of credit cards should be purely based on your lifestyle and spending patterns. “If you spend more on fuel, it is worth going for cards that provide benefits across petrol pumps. If you are a frequent traveler, opt for cards that provide air miles and lounge access," Raj said. It is possible that you fit in all many of these categories. In that case, you may want to look at different cards for different kinds of spends. The benefits of credit cards can quickly turn into drawbacks if you do not exercise self-control and discipline in using them, even if it is just one card you are using. “If a person revolves credit on a card by paying only the minimum amount due, there is risk of paying very high interest—which can lead to debt traps, defaults and poor credit score," said Arun Ramamurthy, founder, Credit Sudhaar. Moreover, having a credit card could also lead to ‘impulse buys’, which means buying things that are not really needed but which are bought on the spur of the moment. This means you would be spending more than your earnings, which is a recipe for financial disaster. While this could be true for some users, data from Kotak Mahindra Bank Ltd suggests that the average spend by a credit card user is only 30-35% of her credit limit. “Even for the entire industry, this number will be in the range of 30-40%. While in some months or periods it might be higher, the average is around this range. In our experience, mostly it does not lead to profligacy in spending," said Sumit Bali, senior executive vice president and head, personal assets, Kotak Mahindra Bank. However, some consumers may find it attractive that they need to pay only the minimum balance on a credit card each month, instead of the entire outstanding. But this would lead to a debt trap. There are credit cards that charge interest at 3% per month on outstanding amounts. If you have an outstanding of Rs10,000 on such a card and decide to repay only the minimum outstanding, 5%, each month then it would take you over 35 years to bring the outstanding amount to below Rs1. 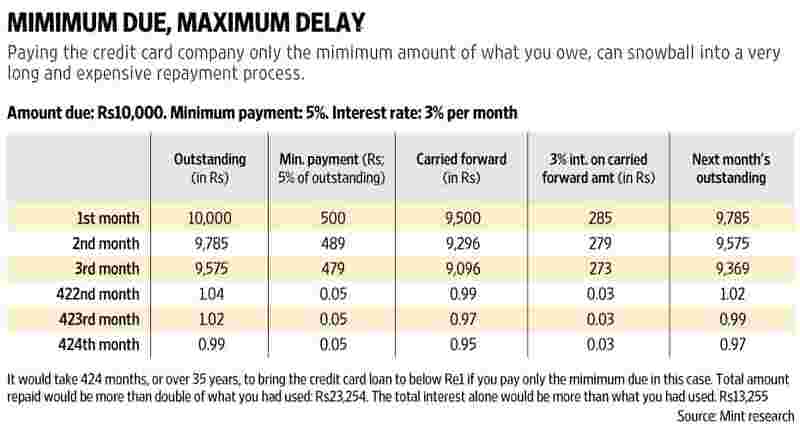 In this time, you would have spent over Rs13,000 in interest payments alone. This is assuming that no more spends are done on this card. Bali said that a lot of people prefer to have two cards. “It could be for managing personal and business expenses separately, or someone may look for higher rewards on a particular category of spending. Also, if a person is travelling and a particular network does not work at some place, thus it is generally advisable to keep two cards," he said. At the same time, multiple cards can create financial indiscipline. “I have some clients who have a bad history with credit cards. One of them, gold medallist from a leading institution, had eight cards and was accustomed to buying consumer durables. We have been working for the past 2 years to bring discipline into his spending. This is one extreme. At the other extreme are people who say they do not need credit cards at all because they can manage their payments," said Prakash Praharaj, founder, MaxSecure Financial Planners. He said that credit cards were useful about 10 years ago, as other forms of digital transactions had not evolved. “Now you have many options for online payments. Credit cards should now be used only when you have a temporary cash issue and need to make a payment instantly. Other than the 45-day (interest-free) credit, there is no major advantage. Ideally, a person should have only one credit card," he said. Moreover, you should not revolve card balances and should try to pay the entire outstanding before due date. “Credit cards should be used as a ‘cheque book’, to effect transactions that one would have normally paid in cash," Ramamurthy said. Also, keeping your card usage below 50% of card limit would result in good credit scores, he added. While you should utilise the facilities a credit card provides, you should be disciplined while using it. Paying only the minimum balance can be tempting, but it could lead you into a debt trap. Not making payments could lead you into a debt trap, apart from spoiling your credit scores and future borrowing prospects too.